Former Black Uhuru lead singer Michael Rose is singing like he hasn't been for a long time, on this majestic and highly recommended roots album, recorded with the producer Ryan Moore from Twilight Circus fame. Expect slow and massive reggae rock, digital roots with lots of bass, with impressive backing by Sly Dunbar, Dean Fraser, Skully, Nambo, Chinna Smith, Bowie McLachlan, Daryl Thompson and Wally Badarou! - Featuring some Reggae's greatest musical talents including Sly Dunbar & Dean Fraser. 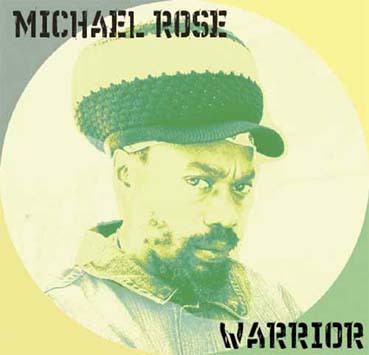 From his early solo work for Niney the Observer through a trailblazing stint as lead singer of Black Uhuru - netting reggae music itÕs first Grammy - to his magnificent later solo work, Michael Rose has consistently remained at the helm of one of reggaeÕs most far - reaching sounds. He can always be counted on to be challenging, topical, musically expansive and lyrically visionary - no small feat in a genre that sets aside old styles like ska, rock steady, roots and dub for the rest of the world to mine as it drives relentlessly forward. Enregistré entre Kingston, Londres et la Hollande, cet album laisse clairement la part belle à la superbe voix de Michael Rose pour des parole conscious et un titre d’album "Warrior" qui rappelle que Michael Rose reste authentique.